Plenty of sustain and top-end bite, but no hiss - cool! Regain noise reduction works well. Not a Dyna Comp clone. 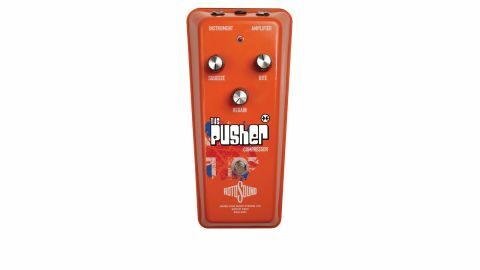 While most guitar compressors available these days seem to be based on the MXR Dyna Comp/Ross design, Rotosound has gone its own way with The Pusher - one of the string-maker's new range of 60s-style effects pedals. "The regain knob works a treat for getting rid of any background noise"
The amount of compression is controlled with the squeeze knob, but you get more controls to counteract any unwanted compression artefacts. The regain knob offers noise reduction, which works a treat for getting rid of any background noise that the compression pulls up, while the bite control feeds some of the uncompressed signal's high-end to the output, to compensate for any dullness that might have been brought about by the compression. Put it all together and that means plenty of sustain and top-end bite, but no hiss - cool!